These offers are free with the purchase of the Giant Escape 1 (2017) Bicycle. The Giant Escape 1 (2017) comes with an ALUXX-grade aluminium frame. The Giant Escape 1 (2017) comes with Shimano Altus shifters, a Shimano altus Front derailleur and a Shimano Alivio rear derailleur. The Giant Escape 1 (2017) comes with rim brakes and Tektro brake levers. The Giant Escape 1 (2017) comes with a composite with alloy steerer fork. The Giant Escape 1 (2017) comes with Giant S-X2 700x32 puncture protect tires. The Price of the Giant Escape 1 (2017) is Rs.48800. 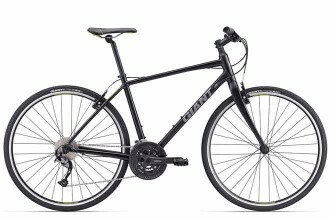 There is no doubt that the Escape series of bicycles from Giant is one of worldÍs most successful hybrid bicycles. The Escape 1 2017 which is the higher end model in this series with high performance derailleurs. There are a few glitches but just the riding experience in traffic on flat roads at higher speeds is something not many hybrid bicycles can match. But there is one negative which must be highlighted, which is the price. At Rs.52,400 the least I expected was a carbon fork and/or mechanical disc brakes. Leaving the price tag out this is an amazing bicycle but unfortunately it is not where close to being value for money. 2. In what condition will I get the Giant Escape 1 (2017)? 6. How will I know if Giant Escape 1 (2017) will fit me without riding it? 7. How long will it take for me to receive the Giant Escape 1 (2017)?